If you check camera prices the way we do, you often catch of a glimpse of the future. 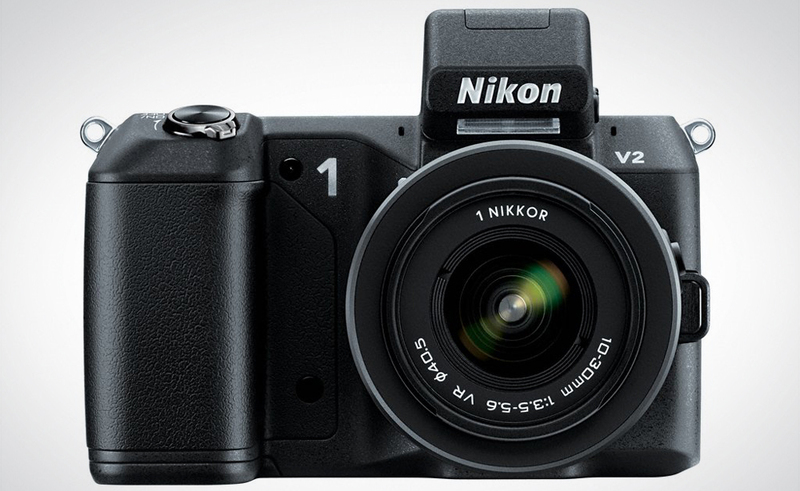 Recently, the Nikon 1 V1 was selling for $500. Since it originally cost $899, that gave a good hint a replacement was on the way and the company wanted to clear out the inventory. Voila! Today Nikon announced the V2, which will be available in late November for $899 with a 10-30mm kit lens. The company added some improvements but unfortunately, it still uses the CX format that didn’t thrill us in the first generation. Given the raft of mirrorless cameras with much larger APS-C imagers (Sony, Samsung), this seems like a fool’s errand. But, hey, we’re just reporters so here you go. The new V2 now has a 14.2-megapixel CMOS chip (versus 10 megapixels) but it’s much peppier at 15 frames per second (rather than the 10 fps of the V1), since it has an improved Expeed 3A processor. Also new is a built-in flash, so you don’t have to spend extra money for an accessory. The company also added a new grip and more external controls, giving it a DSLR feel without the heft (see photos). Beyond that, there are some enhancements to the photo settings, but nothing to shout about. Nikon reports the new camera is compatible with the optional WU-1b Wireless Mobile Adapter, so you can transfer V2 images to your smartphone then out to the social world. Also coming in January is a new flash, the $159 SB-N7 Speedlight, that runs on two AAAs. Also new from the company is a constant aperture f/4 telephoto zoom geared for FX-format DSLRs. When you hear constant aperture, hold onto your wallet and this AF-S Nikkor 70-200mm lens will cost $1,399 when it arrives in November. It has built-in Vibration Reduction technology to help eliminate blur, which is great when you’re holding a hefty piece of glass. The Silent Wave Motor makes it good for shooting video since the onboard camera mic won’t pick up extraneous noise.